Featured: John Malkovich, Gary Sinise. Director: Gary Sinise. There are a few actors that if I see their name in a movie it's an automatic addition to my queue. Christopher Walken and Steve Buscemi are my classic examples of that. They always play the most random roles and even if the movie is going to be really bad I can be assured that their performances will be entertaining. John Malkovich and Gary Sinise are also on that list and are also great together in this movie. 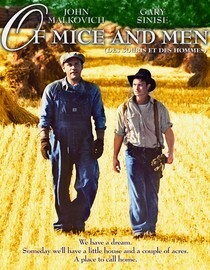 Of Mice and Men is of course based on the classic Steinbeck novel which I haven't read yet but now plan to. I can't talk about how true the movie stays to the book since I haven't seen it but it sure feels like Steinbeck. The story is about a couple of guys who travel and work the fields. One is smart (Sinise) and the other is affected with a disability (Malkovich). The acting was really good, the story was good and to be honest you can't really lose with a movie like this. Now if you'll excuse me I have to go tend to the rabbits. Why is it in your queue? John Malkovich and Gary Sinise! Best thing about the movie? The chemistry and talent of Malkovich and Sinise. What mood should I be in to watch this movie? In the mood to watch a good drama. May I just say what a comfort to discover somebody who truly knows what they're discussing on the net. You definitely understand how to bring an issue to light and make it important. More and more people ought to look at this and understand this side of your story. I was surprised that you are not more popular because you most certainly possess the gift.